Worthing Raiders ensured their National 2 South status following a tense final day this afternoon. 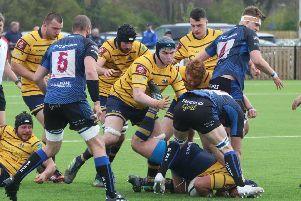 Dino Lamb bagged a hat-trick of tries as Raiders romped to an emphatic bonus-point 50-5 success over already-relegated Exmouth at Roundstone Lane. Having started the day second-bottom in the standings, Raiders' fate was out of their own hands and the victory may not have been enough. However, Barnes, Barnstaple and London Irish Wild Geese, who were ahead of Worthing in the table heading into their final fixtures, were all beaten - helping Raiders climb three places to finish the season in 12th-place. With the pressure firmly on Worthing heading into their final game, some early nerves were eased thanks to a flurry of tries. Joe Watson-Brooks broke away to register the first of the day after 14 minutes, then both Kariym Irving and Lamb followed suit inside the half-hpur. Mark Wathes' try could have handed Exmouth a way back in seven minutes prior to the interval, though, Sam Hewick's bonus-point fourth try on 38 minutes put Raiders in command. Taking a 24-5 lead into the second period, Raiders had things virtually wrapped up less than five minutes after the restart. Both skipper Liam Perkins and Lamb, his second of the day, went over to open up a 36-5 lead for the home side. Lamb completed his hat-trick after 50 minutes, before Matt McLean converted his own try seven minutes from time to seal a thumping 50-5 victory for Raiders. There was a nervous wait while news of others results filtered through, but players and supporters need not worry, as London Irish Wild Geese, Barnes and Barnstaple all lost to ensure Raiders' National 2 South safety. RAIDERS: Storer, Watson-Brooks, Gatford, Barlow, Lake, Lamb, Hewick, Perkins; Leeming, McLean, Irving, Loosmore, Richards, Coxon-Smith, Forrest.